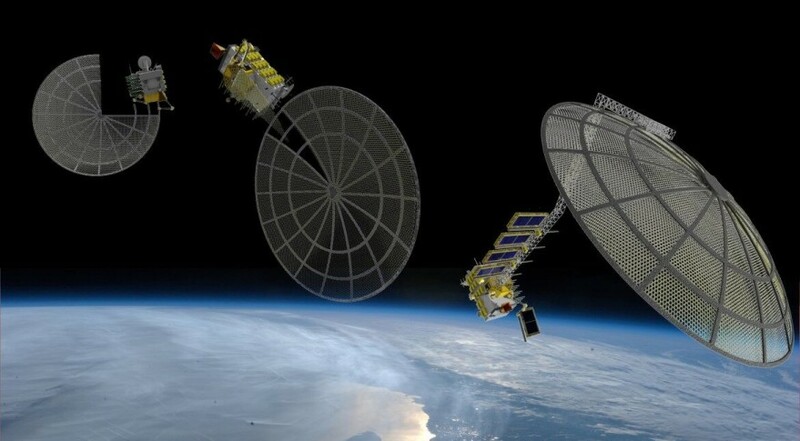 A Made in Space artist's concepts of so-called Archinauts 3D-printing satellite reflectors in space. NASA’s selected the Archinaut project, officially known as Versatile In-Space Robotic Precision Manufacturing and Assembly System, as part of its Tipping Points campaign, which funds demonstrations of space-related technologies on the verge of offering significant payoffs for government and commercial applications. Archinaut was one of three projects NASA selected in November that focus on robotic manufacturing and assembly of spacecraft and structures in orbit. That type of infrastructure would enable NASA and private space companies to launch the raw materials used in additive manufacturing along with certain high-value components like sensors, electronics and batteries. Once in orbit, robotic arms would mate the parts sent from Earth with additively manufactured elements, said Howard Eller, chief architect for advanced concepts at Northrop Grumman Aerospace Systems. If on-orbit manufacturing and assembly are possible, they could revolutionize spacecraft design because engineers would no longer need to create structures capable of withstanding the force of Earth’s gravity before they launch, fitting inside a rocket fairing or withstanding the vibration and acoustic forces of launch, Jurcyk said. Archinaut is a first step on that path. Made in Space is building Archinaut’s 3D printer, which it plans to mate with a manipulator arm built by Oceaneering Space Systems. Northrop Grumman is providing systems engineering, control electronics, software, testing and assistance with Archinaut’s space station interface. If tests in 2018 prove Archinaut performs as intended, Made in Space and its partners hope to continue the project by enlarging the additive manufacturing element and equipping it with additional robotic arms. Eventually, the companies envision a version of Archinaut with three robotic arms capable of latching onto orbiting structures to add or remove components, which eventually would enable companies to remove parts from decommissioned spacecraft and use the parts in new spacecraft, Eller said.